I’m a New England girl. I live right on the Maine/New Hampshire line, just a hop, skip, and a jump from Vermont, the syrup capital of the world. Tree tapping and syrup making are in my blood. Okay, so I haven’t really done it, other than to supervise when I was little, but it’s something I feel I must be doing. Unfortunately, I only have two maples on my property and neither is a sugar maple. I don’t have the time, patience or space to plant sugar maples. I feel as though I am no fulfilling my destiny as a New England homesteader. Well, that’s a given, but did you know you aren’t limited to Sugar Maples? You can also tap Black, Red, Silver, Bigleaf, Canyon, and Rocky Mountain Maples. Sugar maples are most commonly used because of their high sugar content (hence the name), but you’ll just need more sap and a longer boil time from the other varieties to make up for the difference. White, Black, and English Walnuts are good candidates for tapping. They produce a more earthy flavor than maples and don’t produce quite as much sap, but you can tap them at a younger age than you can a maple. Paper, Yellow, Black, Gray, and European White Birches can be tapped for syrup as well. Alaska is known for it’s Paper Birch Syrup. With a sap to syrup ratio of 100:1, it’s more labor intensive to make birch syrup, but the market price for it more than makes up for it. Sycamores can be found in all the lower 48 states and there’s a good chance you can find one in your neighborhood (if not in your own backyard). Sycamore sap can be combined with any other type of sap if you only have one or two trees. I have heard that Sycamore Syrup tastes like butterscotch. Ironwood sap runs a bit later in the season, but from what I hear, it’s worth the wait. Much like the other trees, you need more sap to create a syrup, but the flavor is very rich. Well, yay! I have two Red Maples and a Paper Birch. I am good to go! 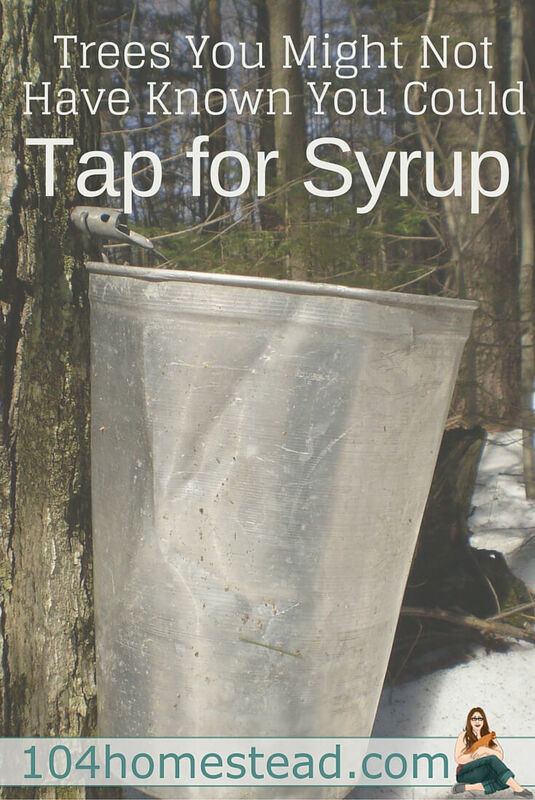 Now that we know what to tap, here are some answers to common syrup tapping questions. How many taps do I need? The average tap produces 1/3 gallon of syrup. Of course, that number will fluctuate based on the weather and the type of tree. A tree of 10-17″ in diameter can fit one tap. A tree of 18-24″ in diameter can fit 2 taps. A tree of 25″ or more in diameter can fit three taps. Where can I get more information about making syrup? Your local Cooperative Extension is a great place to get information that is specific to where you live. 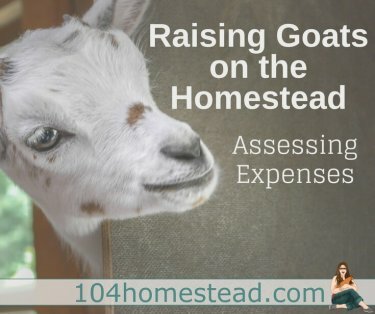 If this isn’t a resource you’ve been using in your homesteading journey, now is the time to start. Maple Tapper also provides a great list of resources that will walk you through the process. As I understand it, boxelder can be tapped for syrup, too. It’s in the maple family. Vermont is far from “the syrup capital of the world” Quebec produces 72% of the worlds Maple Syrup, Vermont, 6%. What tree are you referring to as “Ironwood” I know of at least 3 trees in eastern North America that have that name, it is colloquial, not a proper name. I was just going to say.. sorry not the syrup capital of the world… not even close… Quebec Canada holds that title and has for a long time and it won`t be handing it over to vermont anytime soon. Quebec averages 7,989,000 gallons of syrup a year… Vermont only produces 890,000 so it`s not even a close race. I was just scrolling down here to ask the same thing, too many trees called ironwood for that to be useful. Also, the couple tree I know of being called ironwood I don’t think really ever get big enough to tap. More amazing yummy stuff from your trees is the sugar water. It is one of our favorite things to set taps and then when the buckets are full (there are times when it is hard to keep up with the flow) we just bring the bucket inside and ladle that amazing sweet water into a glass and drink. It is chilled and slightly sweet and SO GOOD. Like tree juice…only not nearly as sweet as real fruit juice. This is also high end goods, as in VT they bottle this yummy stuff and call it VT sweet water, and it isn’t cheap for a lovely small glass bottle of it. So empty your buckets right into your glasses, as a wonderful treat. Then of course boil the rest. refreshing blog entry. Would love to learn and have the perfect maine yard. I am so excited to do this! We have maples and sycamore all over the place! My family started tapping black walnuts on our property last year. We had a lot of fun, with some great tasting results. We are looking forward to trying our hand at tapping our maples this year. Thanks for the great giveaway!!! I was at the Pennsylvania Farm Show this past week and saw stuff about tapping other trees there, too. I didn’t know about this before. Of course, I couldn’t leave without taking home maple candies — yumm! My family has tapped silver maples on our property for 2 years in West Virginia. We need more taps! Thank you! 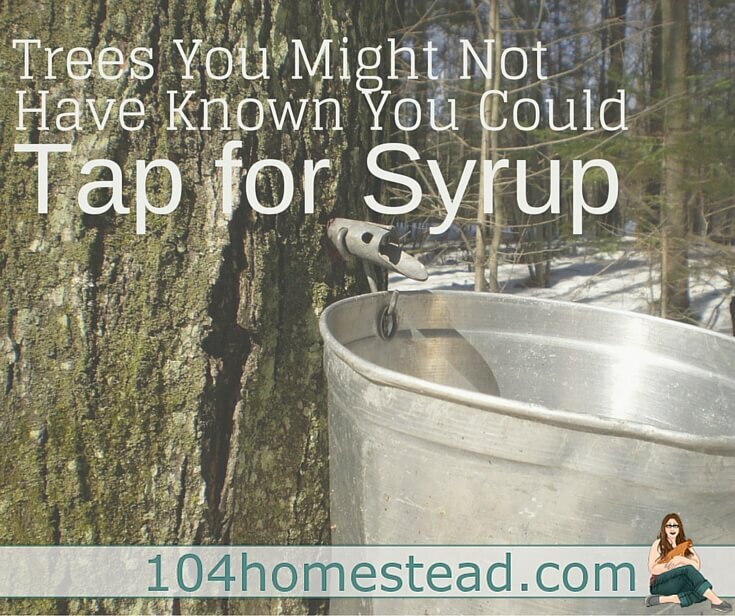 I am fascinated with the idea of making my own maple syrup. When we buy property later this year, maple trees are a priority! Would love to start making my own Maple syrup. We have over 100 acres of Maples, all kinds, and Birch, all kinds. Let the syrup begin. It’s messy, but oh so fun! We have 11 Sugar Maples tagged, can’t wait to tap! Thank you for such a fantastic giveaway. awesome! Our family was just talking about this. Most thought you had to have sugar maples but I was thinking there were other trees that would work. Can’t wait to show them this post. I was wondering that myself, and honestly I don’t know. I would check out your Cooperative Extension office for a reliable answer. I plan to contact mine.